we finally got to go along yesterday afternoon. I expected to be in the maze for a good 1O minutes or so and that would be that but an hour or so later (I'm guessing, I was having way to much fun to keep an eye on the time) we wandered out of the maze finding all 1O nests! We did end up at the exit after only finding 5 nests before we decided we would follow the map, there was no way I was leaving without finding all 1O of the nests. Each nest had a number of eggs in all with different patterns each pattern belonged to a different dinosaur once we found all 1O nests we had to work out which dinosaur had the most eggs. Even tho I'd seen a arial view of the maze on Stanhill farms facebook page I didn't notice the maze was actually in shape of a dinosaur until I was handed the map how amazing is that!!! 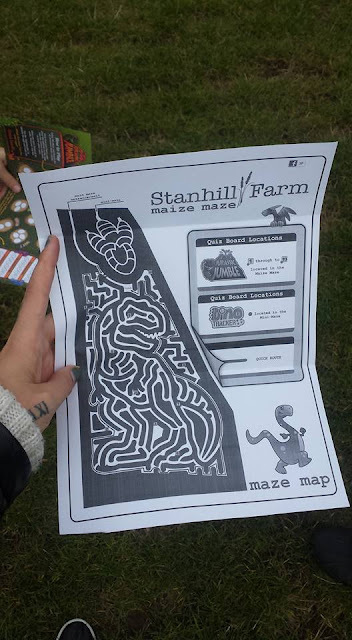 I can't begin to imagine how much work went into getting the shape correct, There's also a dinosaur foot print shaped maze for the under 4's. Even after a few complaints of being tired and sore legs Daisie asked could she turn round and do it all again as soon as we had finished and has asked numerous times since we've been if it's time to go back yet, So the maize maze has a really big YES from Daisie. Stanhill farm is the same farm we get our pumpkins from which you can read about HERE or if you'd prefer to watch our visit you can do so HERE. Just like last time after our walk home me and Andy got to work on a fry up while the girls watched a film in the living room, The walk there, around the maze and back home took it right out of Daisie and while cooking the fry up she had curled up and gone to sleep on the sofa, I even went to bed for an hour nothing beats a family walk I just wish we had some lovely places within walking distance to make a family walk a regular thing for us. 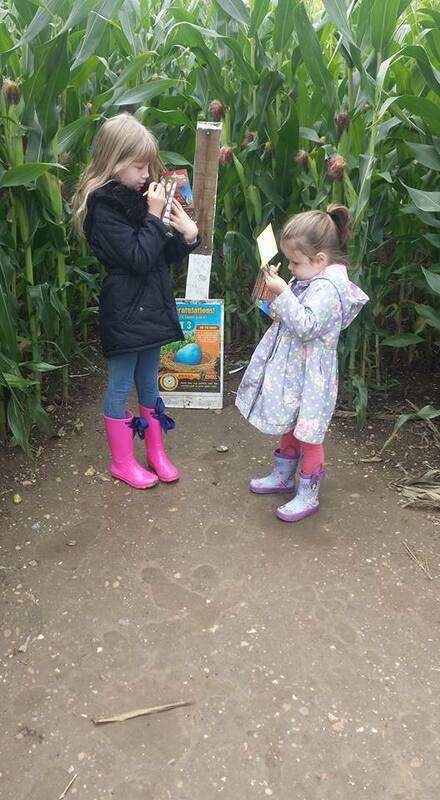 Have you ever been in a Maize maze?